March is National Women’s History Month, a celebration of women’s contributions to history, culture and society. Over the years, the Association of Junior Leagues International has had many remarkable members – from First Ladies to authors, actresses, politicians and more. In honor of National Women’s History Month, here are six extraordinary women who have volunteered with the Junior League. Known for her curls and dimples, Shirley Temple Black made her first appearance on the silver screen at the age of 4. In 1959 she joined the Junior League of Palo Alto. She would go on to head the Multiple Sclerosis Society, become a member of the U.S. delegation to the United Nations General Assembly and serve as the U.S Ambassador to both Ghana and Czechoslovakia. Not only was Nancy Reagan a First Lady of the United States, a dazzling movie star in the 1950s, and the spokesperson for the “Just Say No” campaign, she was also a member of the Junior League of Los Angeles. She currently supports the Ronald Reagan Presidential Library and advocates for embryonic stem cell research. Before authoring Mastering the Art of French Cooking, Julia Child was a member of The Junior League of Pasadena, where she contributed to the League’s magazine. After joining the League in 1935, Julia Child would go on to become a member of the Office of Strategic Service, author numerous cookbooks and star in various television series. The longest-serving First Lady of the United States, Eleanor Roosevelt was a member of the Junior League of the City of New York. After being introduced to the league by her friend, Junior League founder Mary Harriman, Eleanor Roosevelt worked with Junior League volunteers to improve living conditions for immigrants on the Lower East Side. Eleanor Roosevelt was a delegate to the United Nations and served on the UN Commission on Human Rights, where she oversaw the drafting of the Universal Declaration of Human Rights. You may know her best as the Wicked Witch of the West from The Wizard of Oz, but Margaret Hamilton was also a member of the Junior League of Cleveland. Trained as a teacher, Margaret Hamilton worked with children’s theatre programs and was an advocate of causes to benefit children and animals. Visit the Junior League of Seattle’s website or The Association of Junior Leagues International, Inc. to learn more about these and many other amazing Junior League women. Training – All Training info – JLS, AJLI, and online. Don’t forget your two training requirements! Light food and drinks are provided and you are sure to learn something new with the fantastic speakers we have lined up! Please RSVP if you can attend one of these great sessions. May 8th – Taking it to the Next Level: Advanced Social Media Techniques – Currently FULL. Please keep checking the website or add yourself to the waiting list if you’d like to attend this event. Our first self-paced training module, Building Leaders and Blazing Trails: Changing the World with The Junior League, is now online and available to you at your convenience. This is a great way to have a better understanding of our powerful Association. Learn how local women are impacting our community. Check out AJLI’s Webinar Wednesdays to hear from two amazing Junior League of Seattle sustainers, Colleen Willoughby and Dee Dickinson. Both of these inspiring women have been recognized for their commitment to service by being awarded the Dorothy Stimson Bullitt Award as well as being honored by AJLI as Mary Harriman Award winners. You can view both trainings on demand. April 18: “To Lead Is to Serve, How to Attract Volunteers and Keep Them,” featuring: Shar McBee, author. Webinars begin at 1:00 p.m. ET. Be sure to register in advance for the webinars of your choosing. You can also view past webinars on demand. To receive credit for online trainings, print out the certificate of completion and provide a copy to your Active or Provisional Advisor. Or, you may send your certificate of completion directly to Kellea Williams at kellea@amazon.com. For Webinar Wednesday attendance and another training credit, please let your Advisor know which session you attended. We will be able to confirm via the online attendance records. You can take as many courses as you’d like, but you will only receive training credits for one of each. Please contact Kellea Williams, kellea@amazon.com with any questions. To access the online training and Webinar Wednesday’s, log-in to the AJLI website, go to the Training & Meetings tab, and choose Online Learning. If you haven’t set up your AJLI account, you’ll need your AJLI Member # which can be found in your online profile or by contacting administrator@jrleagueseattle.org. What does it mean to be a community and civic leader today? As the foremost thinker on the subject of voluntarism and civic leadership, and as the leading source of civic leadership development and training for women, we are endeavoring to study what it means to be a community and civic leader today. Through these All Member Emails, we are fielding a series of questions that we hope you will ponder as we continue our transformation to preserve our legacy, relevance, and meaning to women around the world. Your answers will enable us to maintain our ability to provide women with the best civic leadership development opportunities available, as well as to solidify our position as a leading authority on the subject. Q. What do you think is the greatest barrier to women who seek the highest level of responsibility in our society? Please click hereto provide your answer. We will collect and sort your answers and then distribute the findings in our next All Member Email. Thank you in advance for sharing your thoughts. The Kashi/Kids in the Kitchen Success Story: $75,000 to distribute to Leagues for local KITK initiatives! As many of you know, The Junior Leagues’ Kids in the Kitchen (KITK) initiative to fight childhood obesity and promote good nutrition got its start in 2006 with inspiration from The Junior League of Calgary’s Junior Chefs program. To date, more than 200 Leagues across the Association have implemented programs in partnership with local community organizations, chefs, and nutritionists. 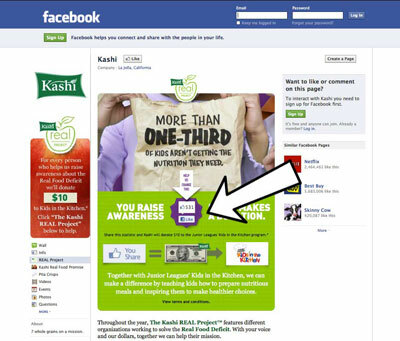 In order to build out the next phase of this successful initiative, AJLI aligned itself with Kashi, the maker of nutritious, all-natural foods, which provided funding for a planning grant and also agreed to make $75,000 available in grants to individual Junior Leagues if the Leagues collectively demonstrated their support for the program through a “Like” button promotion on Facebook. The exciting news is that we did it! We put our money where our mouths (or our mouses) are. We showed enough love to qualify for the full $75,000 the company allotted to us. This means that AJLI has $75,000 to distribute to Leagues in grants of $2,500 or $5,000 to support their local KITK initiatives. As of our grant application deadline earlier this week, we had received more than 100 applications, which will be vetted by Kashi before Annual Conference where the winning Leagues will be announced. Congratulations on this tremendous effort to mobilize; we have truly demonstrated the power we can bring to bear upon a cause we believe in!